In keeping with the ongoing concept of day and night, the children of Playgroup celebrated ‘Black and White Day’ on Wednesday, 24 February 2016. White depicts the day and black depicts night. 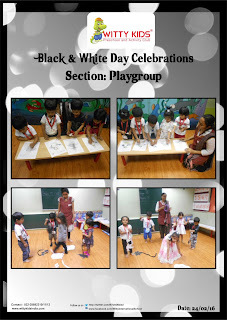 The beauty of this natural phenomenon was explained to the children through the colour black and white. Teachers and children enthusiastically participated in the colour corner game.